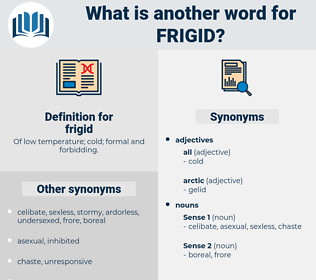 What is another word for frigid? 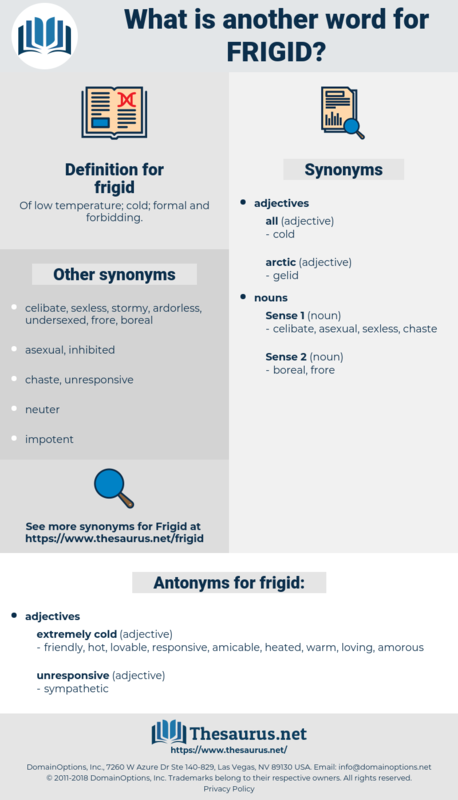 Of low temperature; cold; formal and forbidding. friendly, hot, lovable, responsive, amicable, heated, warm, loving, amorous. fiery, tepid, tropical, seething, burning, white-hot, canicular, inflamed, scorching, sultry, snug, reheated, molten, sizzling, blazing, igneous, steamy, feverish, overheated, fervent, muggy, compassionate, ultrahot, hearty, torrid, warming, sympathetic, happy, scalding, kind, lukewarm, demonstrative, glowing, warmed, genial, eager, flushed, fervid, red hot, broiling, boiling, equatorial, roasting, summery, enthusiastic, kindhearted, warmhearted, emotional, expressive, warm-blooded, toasty. Neither Max nor Diana spoke to each other if speech could be avoided, and, when this was impossible, they addressed each other with a frigid politeness that was more painful than the silence. This rocket plane had touched on the hot surface of Mercury, the first planet, In a little while it would set down on the frigid surface of the last planet.